Following extravasation, drug molecules can either reabsorb into the bloodstream directly by the enlarged postcapillary interendothelial cell pores found in most tissues (67) or enter into the lymphatic system and then return with the lymph (a constituent of the interstitial fluid) to the blood circulation (Fig. 5). Also, drugs administered by subcutaneous, intramuscular, transdermal, and peritoneal routes can reach the systemic circulation by the lymphatic system (Fig. 1). Figure 5 Schematic representation of extravasation and lymphatic drainage. Source: From Ref. 58. Similar to blood capillaries, the lymphatic capillaries consist of a single layer of endothelial cells joined together by intercellular junctions. The diameter of small pores is 12 nm, whereas large pores range between 50 and 70 nm. The rate of formation of lymph depends on the hydrostatic pressure of blood and the permeability of the capillary wall. As blood enters the arterial end of the capillary, the hydrostatic pressure increases and, consequently, extravasation of water, electrolytes, and other blood-borne substances (e.g., proteins) occurs. By the time blood reaches the venular end of the capillary, the hydrostatic pressure drops, and some water and other low molar mass (< 10,000) substances are reabsorbed. However, there is a net excess of extravasation over reabsorption, which results in accumulation of excess lymph in the tissues. This accumulation of excess fluid causes an increase in the interstitial pressure, which forces the lymph to enter the lymphatic system (68). Following absorption in the peripheral capillary bed, the lymph is transported (by large lymph capillaries) to the regional lymph node where lymphocytes are added. The lymph is then taken to the next node up the chain and, finally, into the great vein. Factors known to influence the clearance of drugs from interstitial sites, following extravasation or parenteral interstitial or transepithelial administration, include size and surface characteristics of particles, formulation medium, the composition and pH of the interstitial fluid, and disease within the interstitium (69-73). Soluble macromolecules smaller than 30 nm can enter the lymphatic system, whereas particulate materials larger than 50 nm are retained in the interstitial sites and serve as a sustained-release depot. The use of lipids or oils in a formulation and the presence of a negative surface charge facilitate the absorption of particles into the lymphatic system. Moghimi (74) reported that the inclusion of methoxypoly(ethylene glycol) into the liposomal bilayer can control the rate of drainage as well as lymphatic distribution following subcutaneous administration. Solid tumors, in general, lack lymphatic drainage (75). 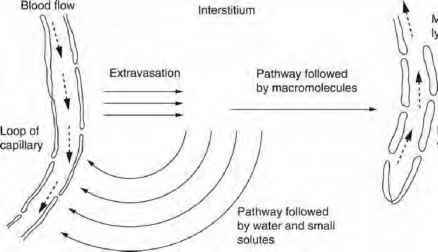 Therefore, macromolecular drugs that enter tumor interstitium, by extravasation, remain there. 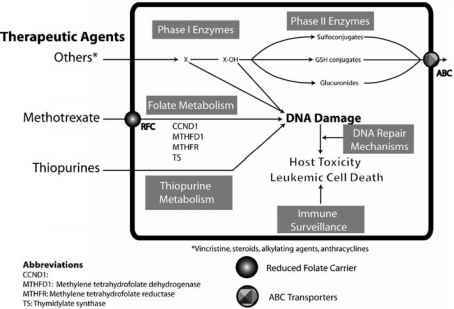 This mechanism is commonly referred to as the tumor-enhanced permeability and retention (EPR) effect (76,77). Tumor-associated proteolytic enzymes may then release the trapped drug in the tumor interstitium. The released drug is then able to penetrate readily through cell membranes and reach its intracellular targets. Active angiogenesis, high vascular density, extensive production of vascular mediators (bradykinin, nitric oxide, vascular permeability factor, vascular endothelial growth factor, prostaglandins, collagenase, and peroxinitrite) that facilitate extravasation, and defective vascular architecture have all been identified as important factors affecting the EPR effect. Possible exploitation of this phenomenon in selective tumor therapy has been discussed in detail by Seymour (58) and Maeda (76). Studies reported by Maeda and coworkers (77-80) show that, in general, EPR effect can lead to 10 to 15 times higher drug concentrations in tumor tissue than in plasma and about 10 times higher tumor concentration than in normal tissue after 24 hours of intravenous administration. It is suggested that drug molecules/delivery systems that remain in circulation for prolonged periods (at least six hours), by avoiding renal elimination or adsorption onto the vessel, can achieve this effect. Recently, Vlerken et al. (81) reported 10 to 100 times higher accumulation of drug concentration in the vicinity of tumor mass following intravenous administration. The direct delivery of drugs into lymphatics has also been proposed as a potential approach to kill malignant lymphoid cells located in lymph nodes.